Representatives of the Lemo of Ode-Lemo presenting a customized card to the DVC (D), Prof. Kolawole Salako during their courtesy visit. The Lemo of Ode-Lemo, Ogun State, Oba Talabi Solesi, has congratulated Professor Felix Salako, on his appointment as the new Deputy Vice-Chancellor, Development, of the Federal University of Agriculture, Abeokuta (FUNAAB). Oba Solesi, who spoke through Chief N. O. Folorunso, Chairman, Ode-Lemo Development Council, gave kudos to Professor Salako for his exemplary leadership qualities while in office as the Director, Community-Based Farming Scheme (COBFAS), of the University. 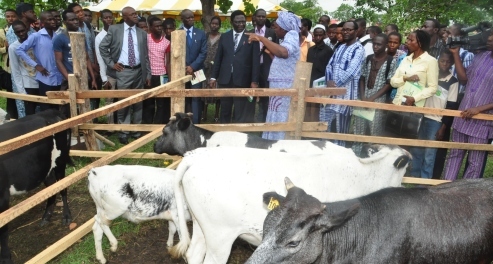 The Monarch described Professor Salako as a worthy ambassador of the University, who ensured peaceful co-existence between University’s students on Farm Practical Year (FPY) and the host community. He also urged the University Management to come up with more laudable initiatives that will enhance the socio-economic development of the community. In his response, Professor Salako expressed his profound gratitude to the monarch for sending a team from his domain to felicitate with him on his appointment and urged the community to extend similar cooperation to his successor, Dr. Joe Atungwu. Dr. Atungwu therefore seized the opportunity to assure the Monarch and his subjects of a better working relationship, stressing that apart from the crop productions training, currently enjoyed by COBFAS communities, efforts will be made to include other levels of seminars, among others.